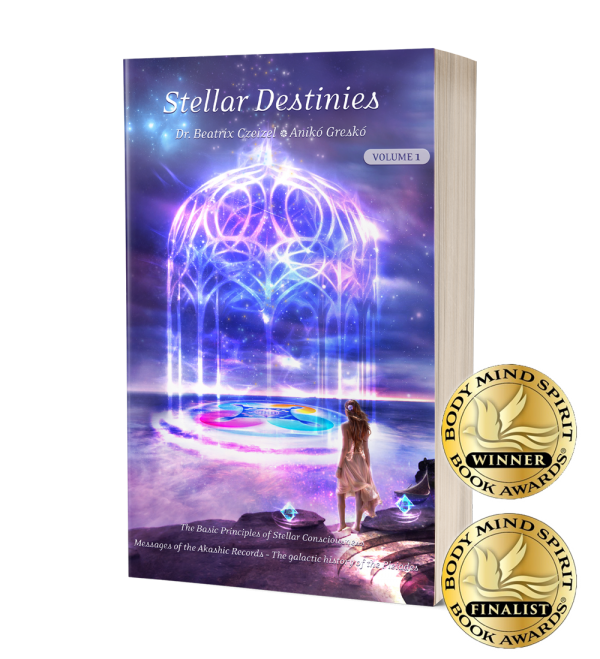 We would like to share the great news we received recently that our book ‘Stellar Destinies Volume I’ was announced as Winner in the New Age category and Finalist in the Angels&Spirit Guides category on the prestigious 3rd International Excellence Body, Mind, Spirit Book Awards. Our ‘Stellar Nations – Soul Families’ book was the winner of the New Age category on the 1st International Excellence Body, Mind, Spirit Book Awards in 2017 and ‘Calling You’ also gained fantastic results on several international Book Contests and became an Award-Winning Finalist in the “New Age” category of the 2017 International Book Awards, Runner-Up for Best Spiritual Book 2016 Amsterdam Book Festival and Honorable mention Spiritual Book on 2016 Paris, New York and London Book Festivals. Moreover it received a very nice critique from the judges in Bruce Haring’s team at JM Northern Media Book Festivals and from Writer’s Digest judges as well. 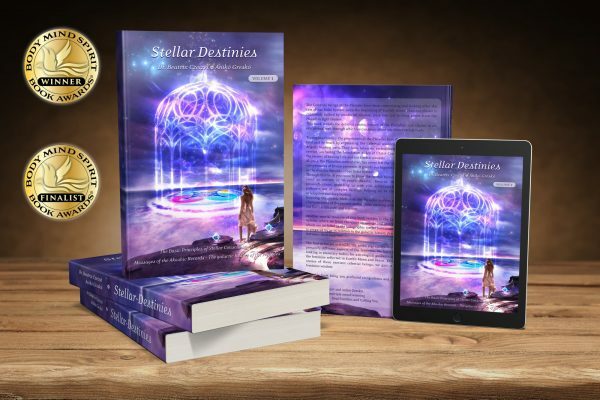 It is so important and makes us immensely happy that now Stellar Destinies Volume I received such great recognition especially in a Body-Mind-Spirit Book contest! This information from the Akashic Records explains the history of the Pleiadian star cluster and our Solar System with a depth and breadth that is missing from spiritual literature. The knowledge shared in Volume I offers an important piece of the mosaic that makes up the grand texture of Creation. This fuller understanding enables us to embody the basics of living with a Stellar Consciousness. There are certain moments in life we can never forget. And there are meetings that accompany us for a lifetime. But further to these, there are touches that change and open our hearts for real. Even if we haven’t been raised this way and even if we happened to be born as boys. This book is so captivating that it affects our intellect and emotions all at once. We can find incredibly rich knowledge and wisdom in it beyond the fact that its language and style seems as though heavenly messengers and fairies were speaking to us. This might be the reason why the understanding and receiving of its contents happens not in our head but in our hearts and souls. This wisdom cannot be argued, it cannot be questioned. That would simply make no sense. Because deep inside, in the bottom of our hearts, we all feel that each line of it is true. In today’s world, when credibility is bleeding from so many wounds – this is an exceptional Treasure. If you let your heart be touched – you find the way home in the multiplicity of your being. gains new strength and cradles its destiny-path into itself. This teaching is a Blessing – its light will become your own, in which each of your step will be familiar! Travellers’ treasure it is – source and origin, which guides you towards the answers hidden in your being. I just call Stellar Nations the Miracle Book. Miracle because it guides you to the deepest core of your being. And it is a miracle also because not only do you gain more knowledge about yourself, but also about others. And it is an even greater treasure because you come to understand the working of not only this world, but the entire universe. And the greatest magic is that once you integrate stellar consciousness, you will not be able to live without it. Through these teachings, I could meet the most hidden corners of my soul in such depths that I could never reach before. Finally I dare to be myself in front of anybody, whoever I am, together with my shadows, as well as the part of myself that lives in the light. I am able to live, love and accept myself and this is the greatest gift I could receive from Fate. This Book lifts us up into wonderful heights, it carries deep correspondences, and it emanates infinite Wisdom, Experience, Love and Life. You can get to know Yourself, the Universe, our Galaxy, our story, the beings who live here, from the tiniest ones to the greatest stars, as never before. In the meantime you can begin to remember who you are, where you have come from and where you belong to; and how miraculous this world is, including Gaia, as envisioned by our Creator. I recommend it with honest love to all the dear readers! The greatest treasure on the pathway which leads us towards knowing our own selves is to regain our memories. There is no greater miracle, than when I can lift the emerging pieces of these memory pieces into my heart and upon burning the experience through my soul – on the Planet of Redemption – I can turn it into Life, drop by drop. This pathway is not easy, but having stepped onto it and living in it I can only encourage all future readers to open their hearts and entrust themselves to the wise and brilliant guidance of this book. I loooooove this book. I wish that I could rate it with 10 stars. The predecessor of this book- “At the gate of transformation” published in Hungarian- was the one that “pushed” me on my spiritual path. The stories of the Pleiadian Sisters help us all to understand our patterns, our motifs and fears. It helps us to accept our true self. It is a very exciting read, you won’t be able to put it down. Since I was a child I was searching for answers deeply rooted in my soul. Why are we here? Who am I? Why do we have to suffer and why God does this to us? I tried to find the answers in many ways but none of them were satisfactory enough. There was always that feeling that I was still missing something out. Then I found this Book and every page I read brought me the feeling of deep understanding and AHA moments. I am so grateful that this Book showed up on my path! I highly, highly recommend this Book to everybody who is still in search of answers, it might change your life. Authors. We can fly together with each story wherever we go. In addition we get also beautiful and deep poems and illustrations.